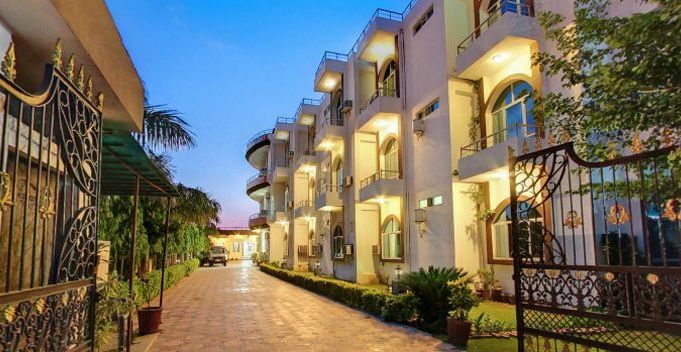 Hotel Siddhi Vinayak Resort nested at the edge of the Ranthambore National Park, Rajasthan in northwest India. The hotel invites you to explore the wildlife in world famous National Park, Ranthambore. The hotel Siddhi Vinayak is a combination of modernism and traditional Indian hospitality in the heart of the Tiger City Ranthambore. The interior of the hotel gives a feeling of Rajasthani cultural with royal style and exotic. The hotel provides best leisure lodging with excellent services and modern amenities for comfortable stay. The resort offers sprawling lawn with adjoining swimming pool. In case of electricity failure there is power backup generating unit in the hotel. A View of the Aravali Mountain provides a unique ambiance of wildlife. Hotel siddhi Vinayak is excelling in professional and personalized service to their guests. There are well furnished 34 Deluxe and 04 Super Deluxe air conditioned rooms. All rooms are luxurious havens with refined in design, modern amenities and latest technology. Each room is equipped with attached spacious bathroom, comfortable large size bad, hot and cold running water, bath tub, Television, intercom, Complimentary toiletries and writing table. There is a multi cuisine restaurant in Ranthambhore Siddhi Vinayak Resort which offers special dining with delicious taste. You can also enjoy with romantic candle light dinner nearby pool.